A shiny new Delos, playground for the world's wealthy and powerful, reconstructed from the chaos Michael Crichton created in "Westworld," will be seen when American International Pictures' new film, Futureworld opened in 1976. The film stars Peter Fonda, Blythe Danner and Arthur Hill with Yul Brynner in a cameo re-creation of his famous "Gunslinger" role. 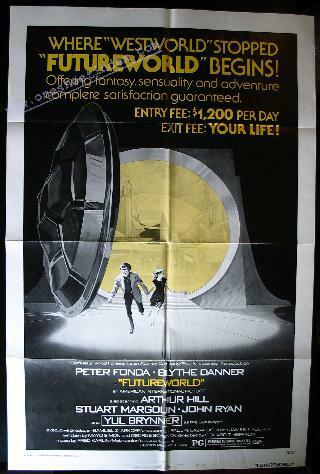 Futureworld marks a sort of reunion for its co-producers James T. Aubrey and Paul N. Lazarus, III. Lazarus produced "Westworld" at MGM when Aubrey was that studio's head. In Futureworld the adult playground Delos has reopened, following the deadly breakdown of robots which caused the deaths of many vacationers in "Westworld." Peter Fonda as Chuck Browning a newspaper reporter and Blythe Danner as Tracy Ballard a TV commentator, have been assigned by their communications group to investigate the new operation because many of the world's most powerful leaders go there to relax. At first, all they see is a magnificently complex, computerized operation where each guest's wildest fantasies are fulfilled. But soon, reporters begin to feel that everything is too perfect - too smooth - to be innocent. Something evil is happening in Futureworld something that jeopardizes the entire world. In addition to Futureworld, the complex includes Roman World, Spaworld and Medievalworld, all serviced by the supposedly now "fall-safe" robots.